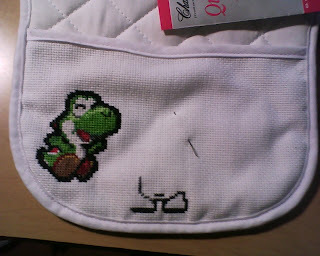 Con Queso's Cross-Stitch/Game Blog: Time off! Sorry guys for the lack of updates, but I'll be gone for a few days more. So I spent like 10 minutes on the bib until I realized I started the 2nd yoshi off center. It's bugging me, should I restart it? I'm so lazy I think I'll just continue, what do you think? It doesn't look too off center to me, the other Yoshi might make it look that way though. Don't start over, I think it looks good! For good or for bad, I'm not that much of perfectionist, so I'd leave it be, if the mistake doesn't stand out too much. In your case, I think it's all right, the bib looks so cute! you should continue looks very promising! Go on!!! are you having a baby? You can hardly notice! Leave it. If it causes a problem then change it, if not just try to make the last one seem in place and add details so you dont notice it. Eh in design they always teach that asymmetry is more visually interesting! I can't even tell that it's off center. It's really cute! I don't know what this is, but I want it. I want Yoshi on everything. Don't quit now, Yoshi needs a buddy! Lyn is not so complete!